The perfect mixed media art for kids. 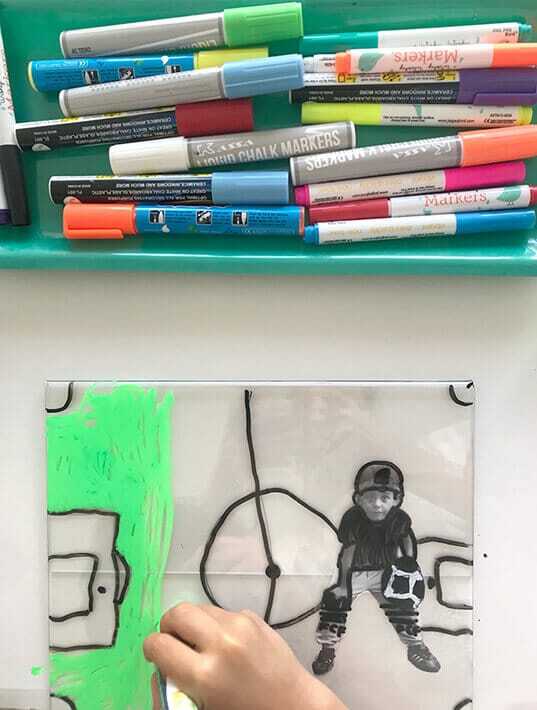 Collage a photograph & paint an imaginary world on plexiglass in this creative self portrait project by Catalina Gutierrez of Redviolet Studio. I love to spark children’s imagination with a book before we start an activity. I find it to be a great way of connecting and silently starting to provoke them while I read and share the illustrations. The book that inspired this fun activity is “A World of Your Own” by Laura Carlin, an amazing children’s book that I love. If you ever get your hands on it, you will be surely captivated by the beautiful illustrations and the magical story behind it. It narrates the life of a child who imagines a world of her own. In this world, houses are off the ground, factories are the shape of whatever they make (for instance a pencil factory, has the shape of a pencil), attendance to school is only once a month, passengers sit on top of trains…and so on. It’s the most wonderful imaginary world one can think of. After reading this book, we got into a really fun conversation that started from one question: “What would a world of your own look like?” As you can imagine they were on a roll! I had to curb their excitement a little, because they had lots and lots of ideas as to what their worlds would look like. I jotted down just a few but the list was never ending and oh-so mind blowing! I really hope you give this mixed media art for kids a go, because it is so much fun! You don’t have to have the book I mentioned to get the kids into the fun of it. You can talk about what your own ideal world would look like. Then ask them to think about what theirs would look like and portray these ideas on the plexiglass. If using acrylics instead of paint markers, you will need a palette, brushes and jar with water. Begin by printing out a B&W photo of the child. Cut around the edge of the photo. Add clear contact paper to the back of it (sticky side up). Leave a border of contact paper so you can stick the photo to the back of the plexiglass. Give each child a sheet of plexiglass with his/her picture stuck to the back of it. Invite them to start creating their Dream World around their photo using black Sharpies. Talk about outlines, and let them know this is just the first step. They will be filling in their drawings with paint markers. Bring out the paint markers and encourage them to cover the whole surface, except for the part that has their photo, adding even more details to their Dream Worlds. Note:: If you want to use acrylics instead of paint markers, they work great too. We did both and loved them. Does your world have flowers? What do people eat? etc, etc. Finally, bring out any fun stickers you may have around. Animals, insects, fairies, flowers, geometrical shape–anything works! Invite the children to add any stickers they want to include in their Dream Worlds. We really enjoyed this mixed media art for kids activity! I hope you enjoy it just as much!